Before Hillary Clinton launched in her campaign speech last Friday night at a New Hampshire fundraiser, she made sure to thank the “thousands of volunteers” who braved the bitter cold to get out the vote for her. “I know how hard you are working. Across the state [you bring] your dreams and determination into this effort, knocking on doors in the winter cold,” Clinton said. On the eve of the primary, the Democratic as well as the Republican candidates rely on thousands of volunteers working for them in the Granite State. Some are locals; many are not. 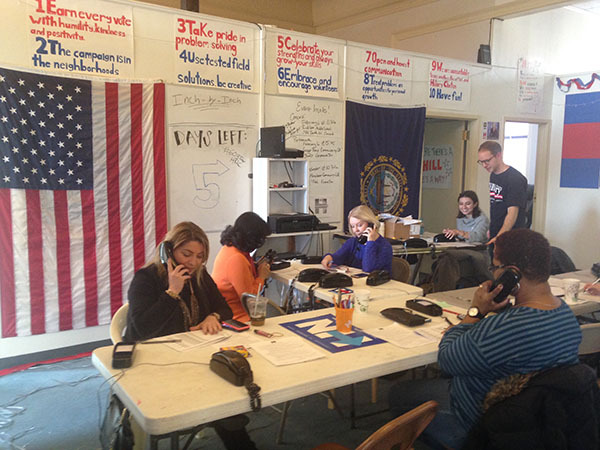 On Saturday, half of the people at a phone bank at the Clinton campaign office in Manchester were from out of state. 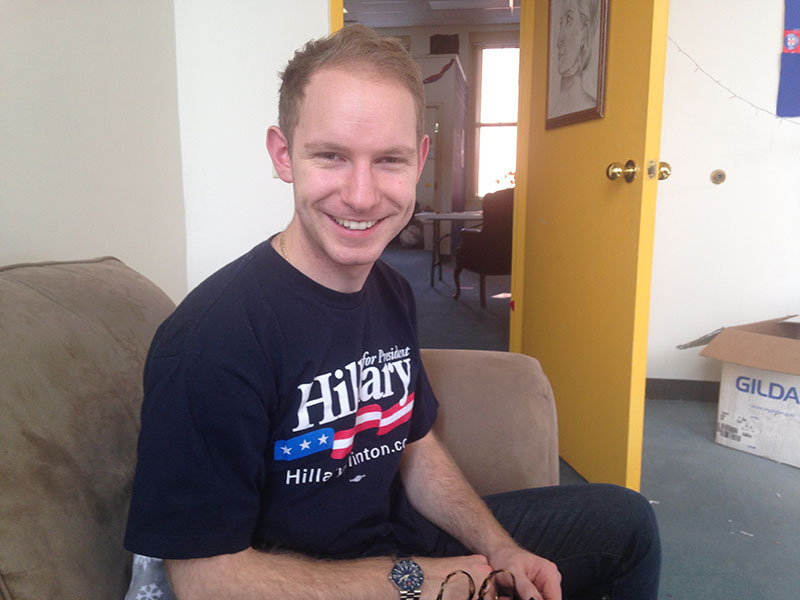 “I am a strong Hillary supporter, and obviously this primary is important, so I wanted to come and help,” said Zach Singer, a young New Yorker from Hells Kitchen who works in investment management. Singer and his fellow volunteers worked in a bright room lined with Hillary 2016 posters and a wall-sized black and white mural that depicts a woman canvassing. They telephoned Democrats and Clinton-leaning independents to remind them about the upcoming primary and to make sure voters know how to get to their polling station. The office is one of 18 Clinton offices throughout the state used as a meeting point for canvassers. One canvasser, Betsy Steinman, a retired psychologist from Manhattan, arrived last week and will fly to South Carolina after the primary on Tuesday to continue her work there. “I worked for women’s rights back in the 60’s and 70’s and this is the last barrier that we haven’t broken. So it’s kind of personal for women my age,” Steinman said about her motivation to come to New Hampshire. At the same Democratic fundraiser on Friday night, Bernie Sanders’ campaign provided free tickets to the event for his volunteers. Among those were 20 supporters from Connecticut who rented a house in Concord to canvas for their candidate. One of them was Angie Parkinson, a high school teacher who wore a red scarf over her light blue “Bernie 2016” shirt. Parkinson got inspired by Sanders last summer and said it was like a “miracle” to find a candidate who shared all her values. “If you had told me a year ago, that I would be going north in the winter to a colder place and knocking on stranger’s doors for a political candidate, I would have never believed you,” she said. Parkinson and her friends spent between six and nine hours a day canvassing during the weekend. In the rural New Hampshire landscape, a car is often needed to go from one house to another. It’s not only the Democrats who ship volunteers into the Granite state. All but one of the Donald Trump supporters I spoke to in his Manchester campaign office on Saturday were not from New Hampshire, but from upstate New York. Laurie and Kevin Bartholomew were among the group of 50 volunteers who drove more than 10 hours to help mobilize voters. “We probably could have phone-banked from New York, but we love it here. It’s the first time I am a part of a presidential campaign,” said Kevin Bartholomew, who is called “Santa” by his fellow volunteers because of his long beard. The volunteers put big “Make America Great Again” signs around the windows of the makeshift campaign office, which made it visible from afar and lured interested voters in. They were greeted by Madonna Priorie, a semi-retired teacher and political activist with Italian roots. “It’s not a matter of meeting Mr. Trump for me. It’s a matter of getting the word out,” Priorie said. When the out of state volunteers weren’t phone banking or canvassing, there was one more item on their to-do list: publically showing their support at a rally. Diane Atkins, was among the volunteers who brazed freezing temperatures to hold a sign in the so-called “Free Speech Zone,” a gathering place for political activists just outside of St. Anselm College, where the ABC Republican Debate was held Saturday night. The energetic New Yorker from Brooklyn matched her outfit to the red-and-blue campaign logo of Ted Cruz. “This is the man. That’s who I want for president. So I came up here with some friends from New York,” she said. Not far from her stood Angel Rhodes and JD Kaplen from Ohio with their “Kasich For President” sign. Rhodes took all her vacation days and her husband, a self-employed business man , was losing money, in order to come to New Hampshire to support their former governor. “A Christie supporter asked us, ‘Who is paying you to support Kasich?’ Nobody is! He is a great guy,” Rhodes said. Almost all of the far travelled volunteers returned to their home states on Sunday night, because of work commitments. But they will all be watching the primary on Tuesday, and they hope that their political vacation paid off.